VIA: In an especially good week for its host Steve Harvey, “Family Feud” has ascended to the No. 1 spot on the syndication ratings chart for the first time. Nielsen estimates for the week of June 8-12 show that “Feud,” produced by FremantleNorth America and distributed by Debmar-Mercury, averaged a 6.1 household rating to edge out longtime gameshow leaders “Wheel of Fortune” (6.0) and “Jeopardy” (5.9). The Nielsen survey said “Feud” was up a big 33% vs. the same week a year ago (4.5). “Family Feud” had tied “Jeopardy” once before, but last week marked the first time since the advent of Nielsen People-Meters in 1987 that it had caught or surpassed “Wheel of Fortune” as the most-popular gameshow in syndication. And it also had to fend off “Judge Judy” (6.0), as the long-running court show typically stands as No. 1 overall in the household ratings derby. “Family Feud” continues to dominate among syndicated originals in key demo categories, with its 2.6 rating in adults 25-54 easily besting “Judge Judy” (2.1), “Wheel of Fortune” (1.7) and “Jeopardy” (1.6). Similarly in women 25-54, its 3.2 rating put it comfortably ahead of “Judge Judy” (2.7), “Wheel of Fortune” (1.9) and “Jeopardy” (1.8), according to Nielsen. The milestone victory for “Family Feud” comes on the heels of a strong premiere for “Celebrity Family Feud,” the six-week summer series for ABC — also hosted by Harvey — that bowed last Sunday. It drew 8.66 million viewers and a 2.4 rating in adults 18-49, making it the week’s No. 1 primetime series telecast in the demo. And Harvey’s own daytime talkshow, “Steve Harvey,” last week was the biggest year-over-year gainer among talkers, up 20% vs. the same frame a year ago (1.8 vs. 1.5 in households). 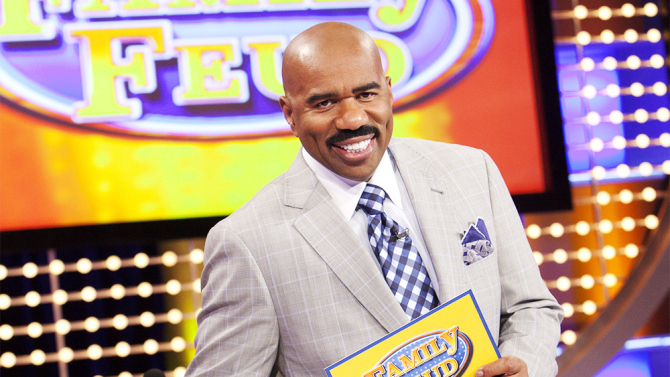 Harvey took over as host of “Family Feud” in September 2010, and the show has been building in the ratings ever since. His talkshow, produced by Endemol Shine and distributed nationally by NBCUniversal Television Distribution, bowed in September 2012.